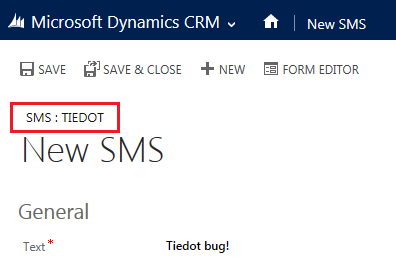 "Tiedot" is a Finnish word that means "Information", it is used inside Dynamics CRM as the default name for the two standard forms (Main and Mobile) when a new entity is created. This is pretty obvious if the base language for the organization is Finnish, but some days ago I discovered a bug regarding the default form names, the base language for the organization was English, the Finnish language pack was NOT installed, but form name and description were in Finnish. My suggestion is to keep inside the development environment the same Current Format as the base language, especially when the customer will use multiple languages. The value returned is the lcid decimal value, there is not a built-in function to return the culture name ("en-US" for LCID 1033) or the language region ("German (Germany)" for LCID 1031). The code to retrieve the members of a specific Team is quite easy, it's a standard QueryExpression, but contains a linked entity with a condition inside, it's good as start point for similar queries. I just discovered Curah!, a free service provided by Microsoft to share links with the possibility to add a comment or a description.